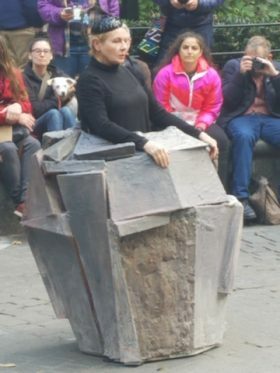 Two-time Academy Award winner Dianne Wiest (Hannah and Her Sisters, Bullets Over Broadway) descended into a courtyard in Madison Square Park and climbed into an artificial boulder to perform a medley of monologues excerpted from Samuel Beckett’s two-act play Happy Days. Beckett’s plays are known for a dark absurdity that hints at the (post-)apocalyptic: among his more famous are Waiting for Godot, the plot of which is contained in its title, and Endgame, in which a pair of legless characters are trapped in a trashcan. Happy Days centers around Winnie, a woman trapped up to her torso in a rock (in this case, a costume by Arlene Shechet), who talks to her largely unseen husband, Willie, files her nails, and occasionally recollects the last living humans she’s seen: a “coarse” couple named Mr. and Mrs. Shower (or possibly “Cooker”) who harangued her and, in a parody of an imagined audience, asked her what she “means.” (“What do you ‘mean’?” Winnie recalls barking). Most of Wiest’s performance–called Passing— comes from the play’s second act, when Winnie is inexplicably now buried up to her neck (here represented by a felt wrap) and is rendered immobile. Complaining of neck pain and loneliness (she suspects Willie is dead, but can’t turn her head to confirm this), Winnie spends minutes puffing out her cheeks, furrowing her brow, sticking out her lips and tongue, and staring down the tip of her nose so that she doesn’t lose further sense of her own body. Getting the opportunity to watch an actress of Wiest’s skill spend minutes fretting about the nature of time and memory while making blowfish faces isn’t one that comes along often, and the audience ate it up. 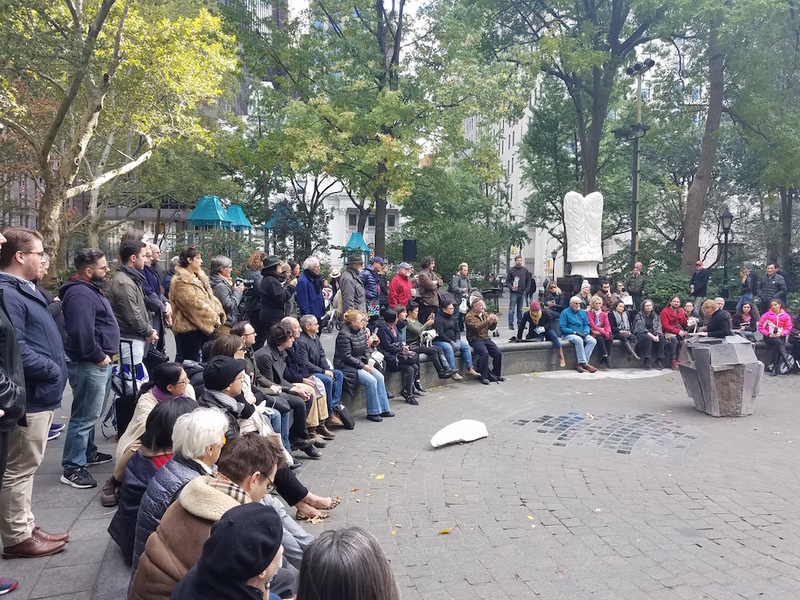 Beckett’s plays are far from crowd-pleasers, but the audience at Madison Square Park was more than game. While much of Wiest’s delivery as the daffily stubborn Winnie drew laughs, more often than not, people looked stricken at her desperation. A crowd of dozens had gathered before her noon performance, and few left as the audience eventually grew to at least 200 before the performance concluded 40 minutes later. Wiest is only delivering two more performances, this Thursday and Friday, noon to 1pm. Grab something warm from nearby Argo Tea and check it out.